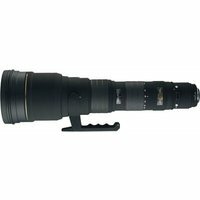 This lens covers the telephoto range from 300mm to the ultra-telephoto range up to 800mm. By continuously varying the angle of view from 8.2º to 3.1º, the lens takes a lot of the footwork out of picture composition.The addition of an HSM (Hyper Sonic Motor) makes fast, silent AF function a reality. The lens is also capable of full-time manual focus.